I have a few books on the go at the moment (and you'll be pleased to know, none are from the authors on yesterday's Forbes list, but instead are lesser-known, but excellent, writers deserving of much more attention), but thought today I'd highlight this debut from a recently new-to-me author for you all. 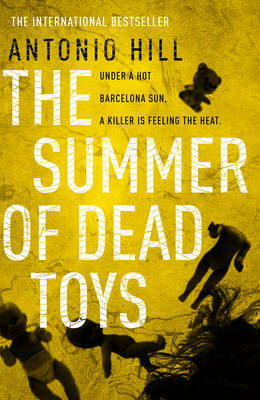 THE SUMMER OF DEAD TOYS is the debut crime novel from Spanish author Antonio Hill. I met Hill at last month's Theakstons Old Peculier Crime Writing Festival in Harrogate, and got to chat to him a bit, which was great (see image below). One of the fantastic things about such festivals is getting exposed to new authors, or authors you hadn't heard of before. Hill appeared as part of a 'crime in translation' panel on the Sunday morning, alongside Swedes Liza Marklund and Camilla Lackberg, and South African Deon Meyer, and it was great to see so many people in the signing line afterwards with a copy of THE SUMMER OF DEAD TOYS, keen to give a newer author a go. I'm a few chapters in, and really enjoying the book already. Hill has terrific, evocative prose, and pulls the reader in immediately. It's one of those books where almost immediately upon starting reading you go 'yes' in your head, and now you're in for a good ride - that it's more than just a run-of-the-mill thriller. There's evocative language, and the author/narrator has a slightly different way of looking at the world that makes things interesting and slightly unique. There's a real 'atmosphere' to his writing and the book, and I'm very intrigued by the character of Salgado. The setting - in sweltering Barcelona, is also very interesting, and makes a nice change from the snowbound Scandinavian climes where much of the recently popular crime fiction in translation hails from. Great stories can be set anywhere, so it's good to have a nice mix. Death in a Hot Climate. Not that it should matter, but Hill was also a delight to meet at Harrogate (see picture, right). He was engaging, insightful, and funny on the panel chaired by Barry Forshaw. Interestingly, he actually works as a translator of novels himself, translating English-language books into Spanish. He also made the comment on the panel that he thought about shortening his name for the cover of his books to 'Tony Hill', but realised that could cause some confusion amongst British crime fiction fans. Have you read THE SUMMER OF DEAD TOYS? Does Barcelona-set crime fiction interest you? What is the last crime novel you read in translation?